Stretch marks are a form of scarring on the skin and appear when we grow or put on weight too quickly (pregnancy or puberty). The skin is stretched to the point where the dermal collagen ruptures and leaves a mark on the skin. Carboxytherapy causes an exchange between oxygen and carbon dioxide. Small amounts of carbon dioxide are injected into the damaged areas of the skin. This causes oxygen to flush to the area. Carboxytherapy is an excellent treatment to dramatically improve the appearance of stretch marks as it causes new collagen to form in the area that has been damaged. Read more about carboxytherapy here. How does RF Skin Resurfacing work? 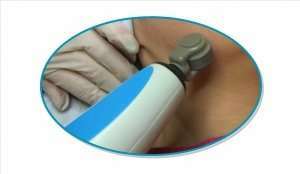 RF Skin Resurfacing uses a radio-frequency roller tip which causes tiny dot or pixel-like damage to the affected areas of the skin. This controlled damage activates the skins healing process and causes new tissue to form in the damaged areas. Read more about RF Skin Resurfacing here. Both microneedling and derma rolling create micro-punctures in the damaged areas of the skin. This stimulates growth factors and causes the skin to produce collagen and elastin, two of the key building blocks of our skin. Read more about our micro-needling treatment click here.